Anyone have any luck installing this weather widget? i know with some of the SB widgets you need to have "wallpaper JPEGifier" tweak so that it will use your current wallpaper. You also probably have to get into root in order to set up your location, refresh, or perhaps the wallpaper. Did you try a respring or reboot? I've never tried this one but often you have to get a file browser (iFile is handy) and navigate to that theme and read its readme.Try to get a file browser that has a search option (iFile has it) so you don't have to hunt for the package manually. I have/use iFile and have gone into the config files to set the location, etc.. 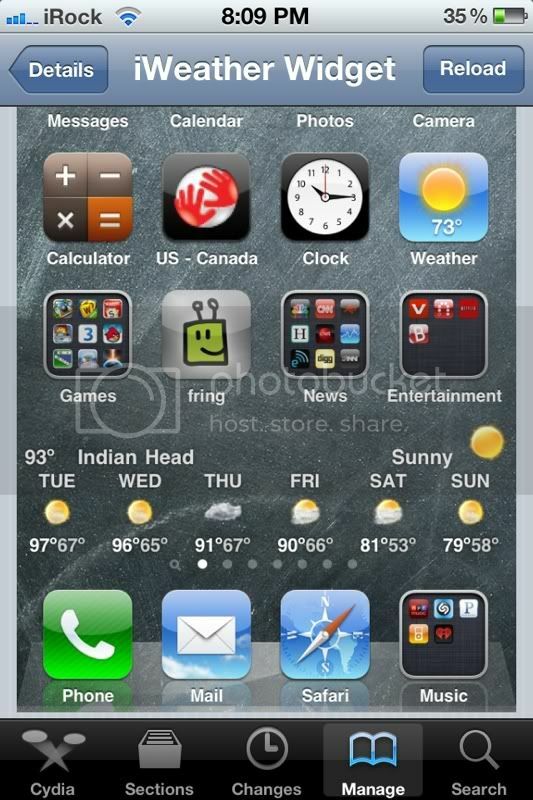 I just can't seem to get this particular weather app to work.. I agree.. I can't get it to work either...strange. I emailed the developer and maybe he will get back to me.. They never responded to me. Oh well.